I had an note broker call call me up the other day and ask me in desperation, "When is the note market going to change?" With no hesitation, I answered. "The bad news is, it already has started to change. The next wave is beginning to build." The real question is, "When are you going to change?" Are you still trying to attract note holders and negotiate note prices the same old way? Live in the now! You might be wondering to yourself, "well if it's already started to change how come I'm not seeing it?" If you are doing the same old things the same old way you most likely will not see the changes that have taken place. Times have changed and you have to change with them before it is too late. Because you are doing the same old things the same old way you always have - tentatively, timidly, hoping that this time it's going to work - you are paving your road to failure. You may have tried a thing or two but you have not spent the time to completely test it for yourself. I've done the testing and I have the results. Learn what works TODAY! Real practical, up to date actual detailed marketing and negotiating methods that myself and other current successful note brokers and buyers are using today. Over the last several months I have seen a marked and steady increase in not only the numbers of note holders contacting us but also in the number of note holders that are accepting our prices. Are you getting your share? Attend the next Secrets of Paper workshop and get the specific details on how to reap the rewards of the upcoming wave in the seller financed note industry. 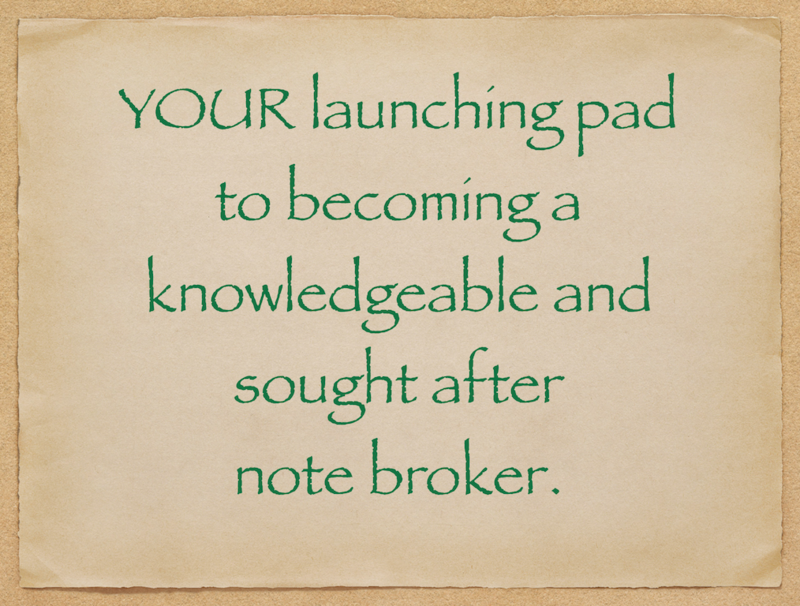 For new or experienced note brokers this is a must attend event. Selling a property in today’s uncertain market is a major concern for investors, homeowners and individual property owners. I was recently reading on the internet or in an email the other day that Zillow.com reported a drop in home values alone of over $2 Trillion in value. Less than 2 years ago 1 in 400 real estate transactions were seller financed. Today they are predicting 1 in 50 real estate transactions to be seller financed! In short, there will be more notes for us in the note business to go after, which means more opportunity to get our marketing seen, which means higher response rates, which means more accepted prices and more closed transactions. 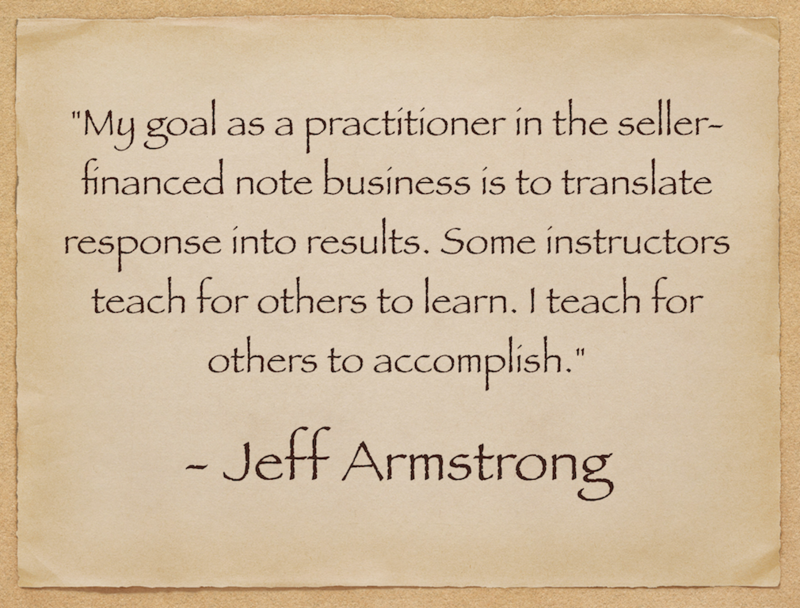 This year in the seller financed note business I am looking forward to an increase in both volume and closed transactions. Especially, with the way the economy is right now in the stated recession, people will need money and will be more agreeable to accepting one of our pricing options. Will you be getting your share? Not Sure If This Workshop Is For You? This workshop is for people who want to get into the seller financed note business, people who are just starting out in the business, people who have been dabbling in the business for a little while but now want to get serious, people who were in the business in the past but want to get back into it now or who are experienced note brokers and buyers that want to learn the latest marketing methods that are working in our current market. It is also for real estate agents, real estate brokers and mortgage professionals who are not doing as well as they were a couple years ago, who want to add something to their business to keep the cash flow coming in and who want to learn how seller financed notes can help them sell more properties in the current market. If you have any questions or you are on the fence wondering if this workshop is for you or not, please give me a call at 800-845-3055. This is an Advanced Beginner's continuation to the Secrets of Paper 101. A live 3-day action-oriented workshop concentrating on Marketing, Beginning Calculator Skills and Negotiating. 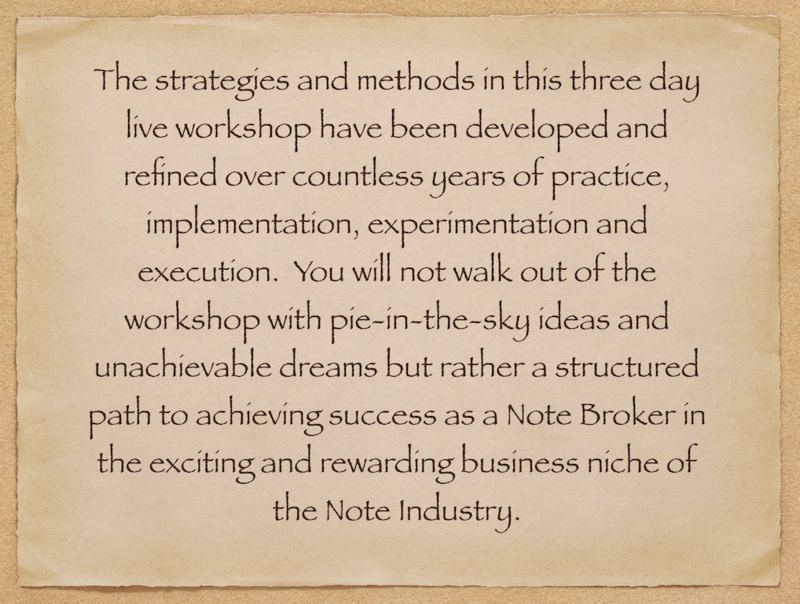 In the Secrets of Paper 201 workshop we will expand on the note business process of how to Find them (the note holders), Expose them, Educate them and Support them to earn your FEES. 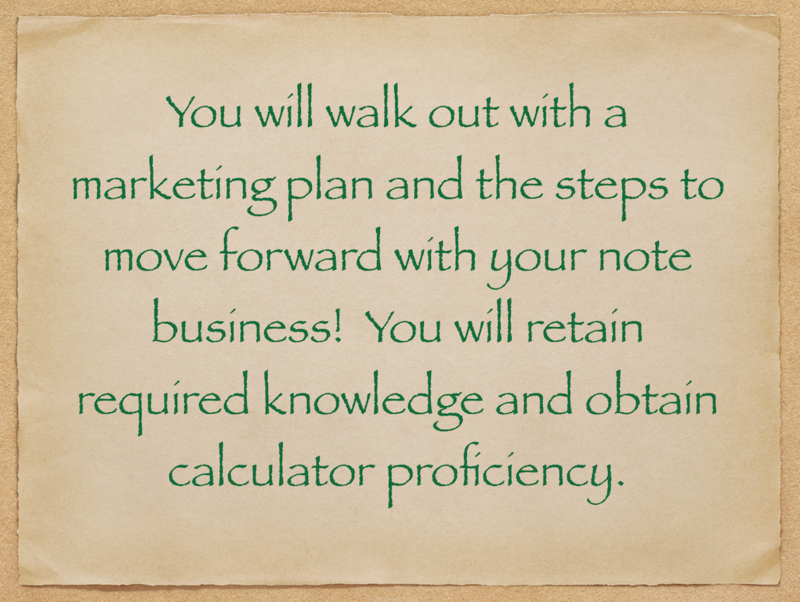 We will further break down the components of the seven basic steps (Basic Marketing, Gathering Information, Submit for Pricing, Obtain Offers, Subtracting Your Fee, Presenting the Options and Following up) into practical and effective solutions so that you have a hands on workable knowledge of the note business. Once you learn the process and follow the steps correctly you will earn your F.E.E.S. and be able to repeat the process again and again. The Secrets of Paper 201 Workshop will be limited to 30 people, sign up NOW to reserve your spot! 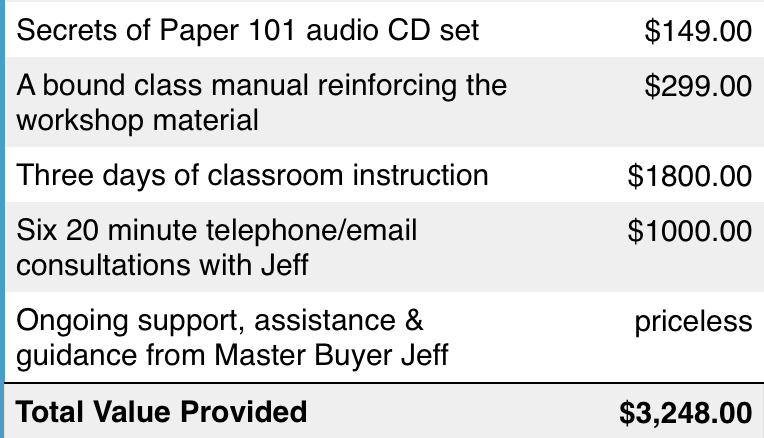 The workshop includes a class workbook, all handouts and extras PLUS lunch every day. The content is fresh, current and real. There are absolutely NO upsells. Just pure, up to date, genuine information, existing tactics and inner workings of the note business. After the workshop is over you will have Jeff's support as long as needed. Ready to schedule a live workshop? Want the Home Study Course? For more information give us an email or call at 800-845-3055!